C. Edward “Ted” Fee, the recently installed Morton Aldrich Professor of Business, has authored papers exploring corporate finance issues in the NFL and the motion picture industry. 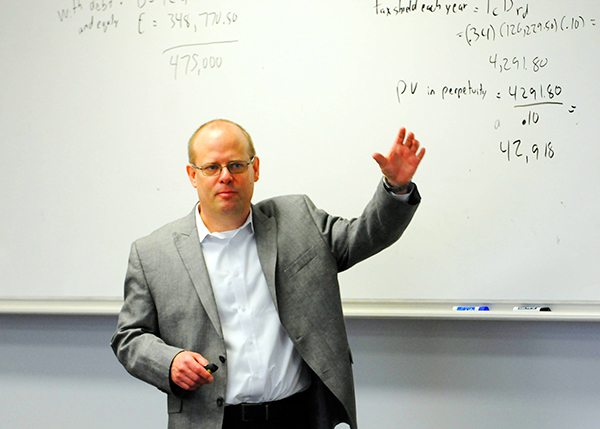 Finance professor C. Edward “Ted” Fee focuses his research on the effects of corporate financial policy, but the recently appointed Morton Aldrich Professor of Business has been known to apply that lens to some offbeat subjects. His PhD dissertation looked at how Hollywood motion pictures are financed, exploring the factors that lead producers to seek funding outside the studio system. He also wrote a paper that applied the concept of managerial tournaments to the NFL, investigating whether the prospect of promotion incentivizes assistant coaches in the same way it incentivizes managers within a corporation. Fee’s current research on mergers and acquisitions is similarly unconventional. Instead of focusing on the firms involved in the merger, Fee looks at the bigger picture, investigating the effects on customers and suppliers as well. 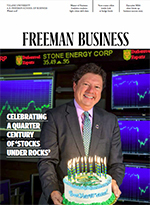 A 1990 MBA graduate of the Freeman School, Fee spent four years in New York as a financial analyst and options trader before leaving to pursue doctoral studies. After earning his PhD from the University of Florida, he joined Michigan State’s Eli Broad College of Business as an assistant professor of finance in 1999. Since embarking on his academic career, Fee has won a number of awards for his research. Last year, he earned the prestigious Michael J. Brennan Best Paper Award from Review of Financial Studies for his research into how a manager’s personal characteristics affect the policies of his or her firm. The paper was in response to a growing belief that the random personality traits of CEOs — such as being a risk-taker — play a significant role in determining corporate policy. While Fee doesn’t dispute that a manager’s personal style can influence his or her decisions, he dismisses the idea that corporate policies must then be based in large part on the random chance of the CEO’s personality. In addition to serving as Morton Aldrich Professor, Fee was also tapped to succeed Sheri Tice as finance area coordinator. In that role, he’s played a major role in the Freeman School’s faculty hiring initiative as well as the development of a redesigned PhD program in finance and financial accounting.